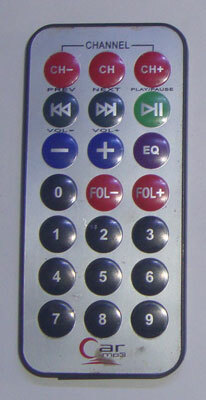 The Mini Remote is operated with a 3 volt Lithium cell. It is based on a high performance Chip and its range is as high as 25 Meters. The output frequency of the IR beam is well programmed for error free operation. Open the cover of Remote and remove the circuit board. Remove battery also. You can see the contacts for the battery. Just solder two wires to the + and – contacts. On the back side, there are contacts for the press buttons to change channels, volume etc. 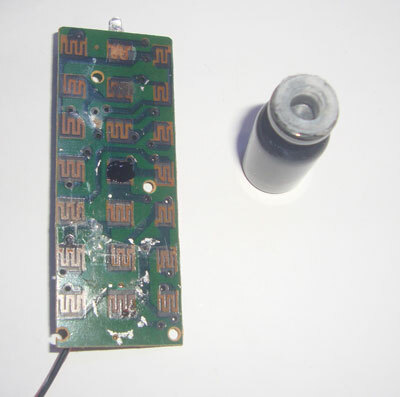 Unlike the TV remote, the contacts on the PCB are not Copper tracks but tracks made using Conducting ink. It is a kind of Carbon based ink that conducts electricity. When we press the button, the Carbon pad of the button makes contact with the tracks and the remote functions. We cannot solder the tracks for shorting, since the tracks are dry conducting ink. So apply some Conducting ink on any button track to short the tracks (You can purchase the Conducting Ink from Electronic component shops). So the shorting makes the button operating continuously just like we press the button continuously. The IR Tester is ready. 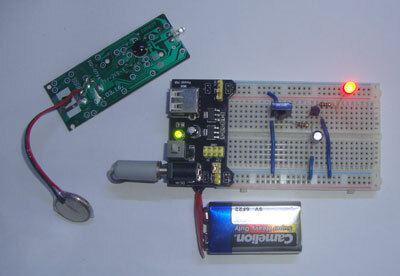 Connect 3 Volt battery or 3-5V Power supply. The IR LED in the Remote continuously emits Pulsed IR rays that can be used to test the project. The advantage of this Tester is that, we can place the Transmitter in a distant place while checking the circuit on the Breadboard. If a TV remote is used, we need the help of somebody to press the Remote from a distance while we test the Project. So this Tester correctly assess the Detection range of the Circuit we are making.